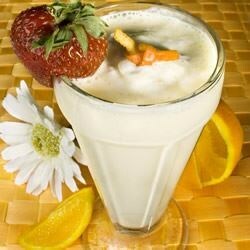 In a blender, combine orange juice concentrate, milk, water, ice cream, sugar and vanilla. Blend until smooth. Insert ice cubes, and blend until thickened. Pour into glasses and serve. Homemade, yet reminiscent of a famous orange smoothie. This was not to my liking, I couldn't even drink the whole thing. Maybe it was the brand of OJ concentrate that I bought that made it taste so bitter? Delicious although a bit too sweet. We cut the sugar back to 1/4 cup and it was still a bit too sweet for us. Perhaps only a tbsp or two for us next time. This was a realy GOOD recipe, thanks 4 sharing! pretty good, I didn't add the sugar per the other reviewers and I'm glad I didn't. Next time I might even buy unsweetened orange juice. Made as is except for vanilla frozen yogurt instead of ice cream. This is pretty good and very easy. Although it does not need the sugar and I would not use that again. As Kate said, and I have to agree with her "Deeeeeelicious!"